Hotel Phillips Kansas City, Curio Collection by Hilton is an iconic hotel with an illustrious past. Originally established in 1931, this Kansas City hotel was once the tallest building in town, standing 20 stories high and boasting 400 guestrooms. It was the first hotel to have radios in each room. In the Glennon Hotel, which stood in the original site of Hotel Phillips, a famous gentleman ran the haberdashery on the ground floor: one Harry S. Truman. An art lover’s paradise, Hotel Phillips offers beauty around every corner. Original Art Deco features include elaborate bronze and nickel metalwork, lustrous walnut paneling, and stylish light fixtures. Back then, as now, gazing over the lobby is a gilded 11-foot sculpture of the Goddess of Dawn, known as the mother of the stars. And plenty of stars have certainly glided past the gleaming marble walls over the decades, from John Barrymore through current-day celebrities such as LeBron James and Paul McCartney. Today, the hotel offers 216 elegant, modern guestrooms, while maintaining much of the historic charm and original Art Deco features which make it a true gem in the heart of downtown.​ The hotel hosts weekly performances by jazz musicians, and also has an artist-in-residence program in which the works of a chosen artist is displayed throughout the hotel. Those who seek adventure can look for the speakeasy with a hidden entrance in the lower level. Entry is granted with a password. Hotel Phillips was listed in the National Register of Historic Places in 1979. The hotel was voted "Best Hotel in Kansas City" by KC Magazine in 2014 and 2015, and also voted "Best Hotel in Kansas City" by The Pitch in 2014. 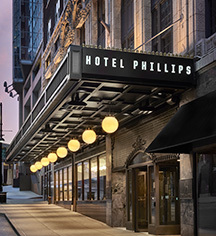 Hotel Phillips was also awarded the "Arts Impact Award" by ArtsKC. Hotel Phillips Kansas City, a member of Historic Hotels of America since 2016, dates back to 1931. The hotel still has a few "trunk rooms." These are the original sized rooms when the hotel was built in 1931, when occupants were mostly business men who would come to stay and only needed a bed and space for their trunk. Adjoining Rooms: The hotel has connecting/adjoining rooms, which are subject to availability and can be requested by contacting the hotel using the number on the booking confirmation. Early Check-In/Late Check-Out: Available based on availability. Late check out fee $50. Parking: Valet parking: $24.00 for overnight (In/Out privileges); $12 for short-term. Rollaways: Available upon request; $20 per night. Smoking Policy: Non-smoking property. $250 charge if evidence of smoking in room. Hotel Phillips Kansas City, Curio Collection by Hilton is an iconic hotel with an illustrious past. 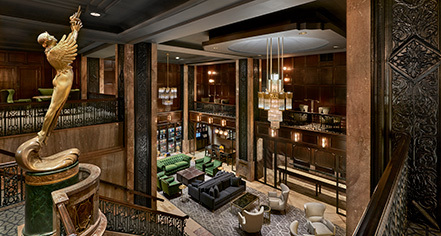 Originally established in 1931, this Kansas City hotel was once the tallest building in town, standing 20 stories high and boasting 400 guestrooms. It was the first hotel to have radios in each room. Learn more about the History of Hotel Phillips Kansas City, Curio Collection by Hilton .